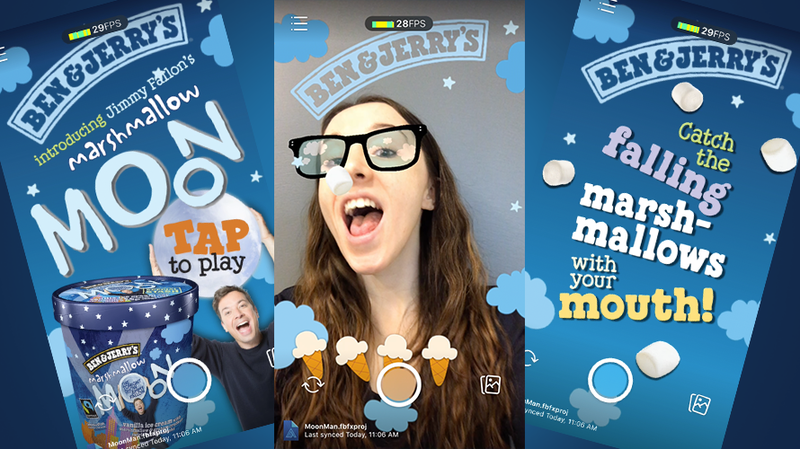 If you open up Facebook today to use one of the platform’s augmented reality filters, Ben & Jerry’s wants you to play a little game with your selfie. While there haven’t been a lot of interactive Facebook AR filters, a number of brands like Wendy’s and Kraft Mac & Cheese have used similar gamelike features within Snapchat lenses. The Facebook filter is part of a bigger campaign to launch the ice cream brand’s newest partnership with Jimmy Fallon. On Wednesday night’s episode of The Tonight Show with Jimmy Fallon, the late show host launched Ben & Jerry’s latest flavor—Marshmallow Moon, a vanilla ice cream base with s’mores ingredients mixed in. Unlike other Ben & Jerry’s flavors, Marshmallow Moon can only be purchased in the brand’s shops and online as part of a new initiative called Special Stash, in which Ben & Jerry’s makes microbatches of flavors for limited periods of time. The brand claims on its site that these Secret Stash flavors are “so weird and wild that they can’t be produced in large batches.” All proceeds from Fallon’s Marshmallow Moon are donated to the SeriousFun Children’s Network, an organization that aids children with serious illnesses. This isn’t the first Fallon-involved flavor the company has rolled out. The late-night host also has his own flavor called The Tonight Dough (comprised of caramel and chocolate ice cream with chocolate cookie swirls and two different flavors of cookie dough).